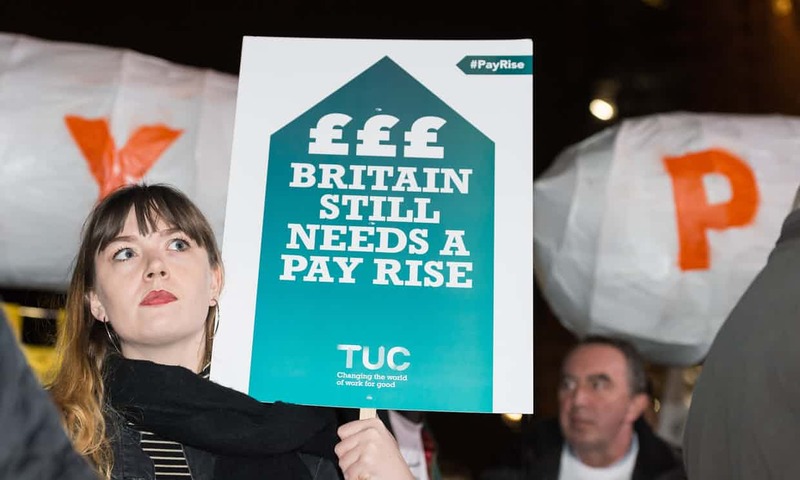 TUC says real wages are still lower than they were when the financial crisis hit in 2008 [Image: Wiktor Szymanowicz/Barcroft Images]. The economy is failing, Brexit will make it worse, and employers are hogging their takings because Tory government employment policy allows it. Inflation is increasing and wages aren’t. The exploiters in government and in industry are squeezing you hard. There is no justification for it. Don’t believe the mealy-mouthed mumblings of the men and women in suits. They have been saying the same nonsense for years and it was never true in the first place. Sadly there seem to be millions of people who are willing to believe it, though. Can you afford to let them continue with this mistake? Britain is set to have the worst wage growth of any wealthy nation next year, ranking behind Italy, Greece and Hungary, according to analysis by the TUC. The UK is forecast to come bottom from 32 Organisation for Economic Co-operation and Development wealthy nations for wage performance in 2018, according to the study of OECD figures by the unions’ umbrella group. British workers are expected to see their earnings decrease by 0.7% in 2018 when taking account of inflation, which has surged in the past year as a result of the pound’s weakness since the EU referendum, pushing up the cost of importing food and fuel. Only two other OECD nations – Spain and Italy – are expected to record negative wage growth, although both still outperform the UK. In contrast, Hungary is expected to come top for real wage growth next year, with pay set to accelerate by 4.9%. The eurozone is forecast to see growth in earnings of 0.6%. The economy isn’t failing, andbrexit will improve matters when we eventually leave. Nissan was famously bribed by Theresa May, of course. Businessmen said all these wonderful things you mention, did they? Would these be businessmen who see a way to take advantage for themselves, while hanging the rest of us out to dry? I think so. The very rich may benefit in the short term, by taking advantage of Brexit to exploit you. And when I say “you”, I mean you, B Dixon. You may live to regret Brexit, but I doubt you will live to recover from it. “Food will be cheaper” – how gullible could you be? You are obviously viewing the economy from a long way up the tower, where tax evasion and avoidence are the norm and you cannot see the floor where good British workers are finding themselves back in the world of having to pay for their food on payday and are living “on the book” as they did before their unions took on the selfish! What planet are you on Barry Davies? If we look at wage growth and productivity we see that Britain’s economy grew whilst wages fell. So that means employers could have paid more but refuse to. The truth is now clear, when employers said back in the 1980s that they had learned the lessons of the 1920s, we now know exactly what they meant. They are happy to exploit people when they are weak, and in contrast to their promises of no return to the 20s and 30s, that is precisely what they have done. The rich get richer and the poor get poorer under the Tories. Rising debt levels put us back to the days of the Financial Crash in 2008, so for all the pain on low incomes we go right back to the start, where all our problems began, ‘Neo-Liberal mythology’ lies at the heart of everything.